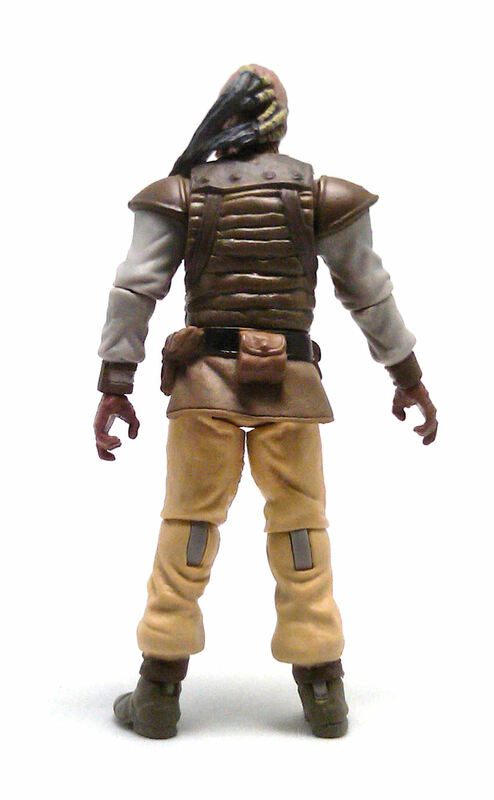 One of the last figures from the Star Wars Vintage Collection is one I had been waiting to get for quite some time. The vintage Kenner Weequay was one I really liked from my childhood, because it was one of those figures whose arms were made in a pose that was not just straight down. 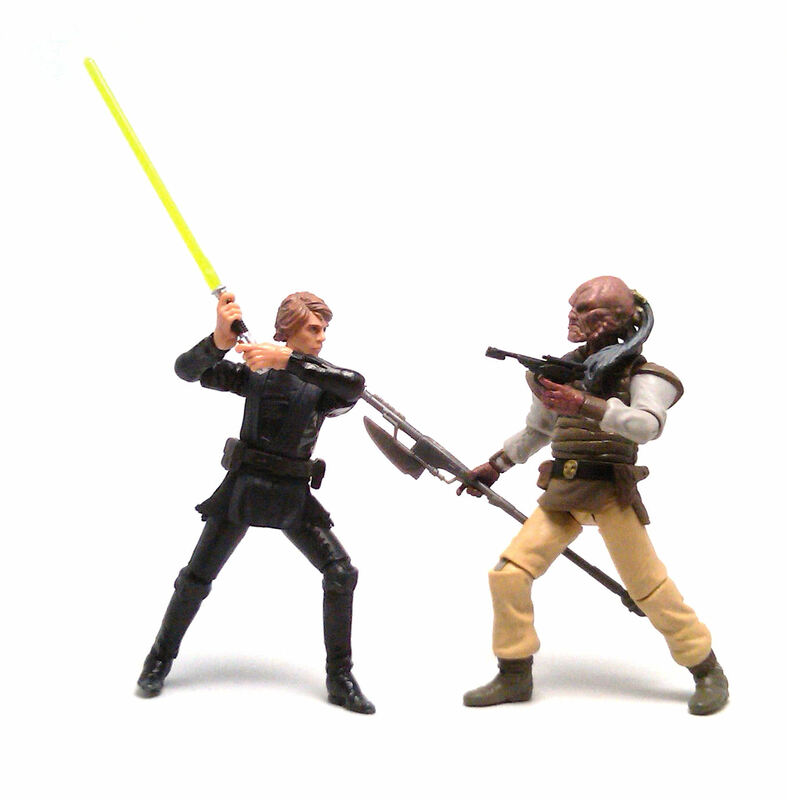 Of course, there was a version released back in the Power of the Force line, but even then, I considered the vintage one to be the better release, mostly because the POTF one had a rather extreme action pose and looked way too bulked up. 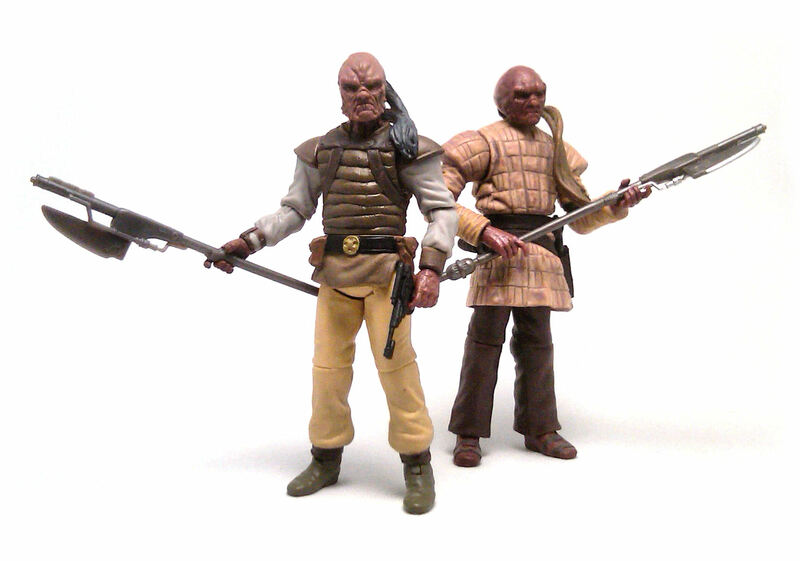 Then came the 2012 release of the Weequay Skiff Guard (VC107) and for the first time I think the Kenner one has a worthy successor. The character costume doesn’t really have a lot of detail, consisting mostly in loose, neutral-colored garments. 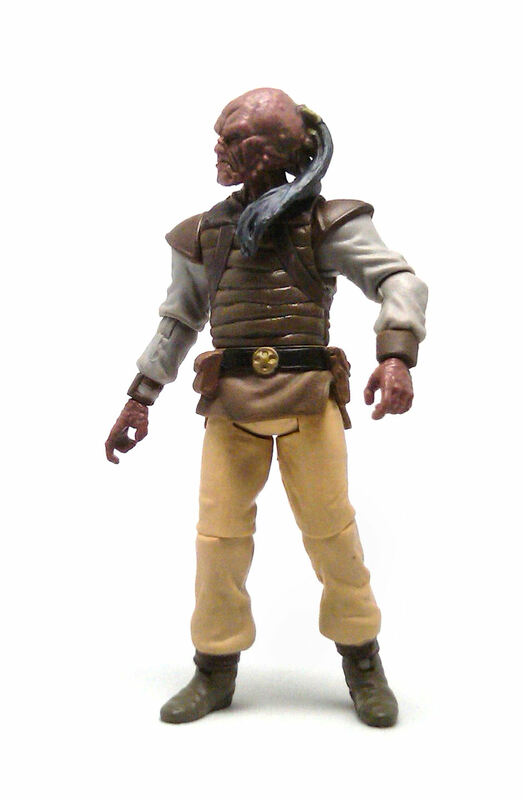 The more detailed bits are the padded leather jerkin and the head itself, which is actually quite unique, screen-accurate and oddly enough, looks much more “alive” than the mask used in the film. The padded vest has fairly uneven lines sculpted across that convey a sense of well-worn garments, and his belt incorporates a number of pouches and containers, as well as the hem of the tunic. This time around, the character design allows full functionality to all of the articulation points, which is something fairly rare for figures that include rubber skirt pieces in their design. The paint applications are very minimal and limited to the odd color accent to tie together the look of the outfit, like the shoulder pads and the cuffs of the boots. The one thing I didn’t quite like as much was that the new Weequay’s shirt is light gray instead of light blue but, then again, the coloring on the Kenner Weequay wasn’t really screen accurate to begin with. Also, the articulation disks all over the figure are molded in the same light gray plastic , which is fine for the arms but can be a bit distracting at knees and ankles. At this point is obvious that matching pin colors to the surrounding materials is not a priority for Hasbro, so I won’t deduct any points on that account. 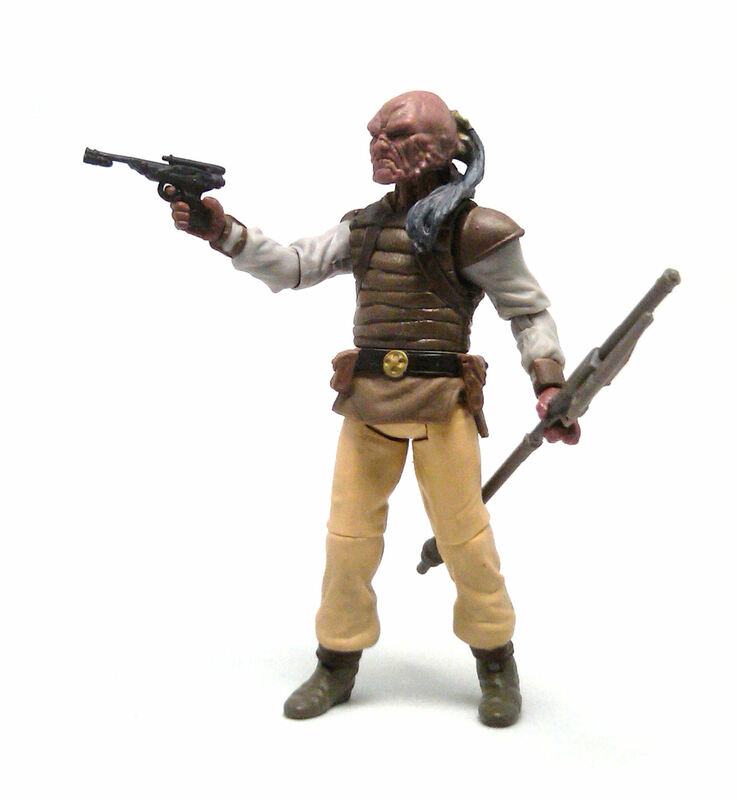 This Skiff Guard comes armed with a force pike molded in silver gray plastic with brighter silver detailing and one of those fancy blasters issued to Jabba’s goons, molded in plain black plastic. 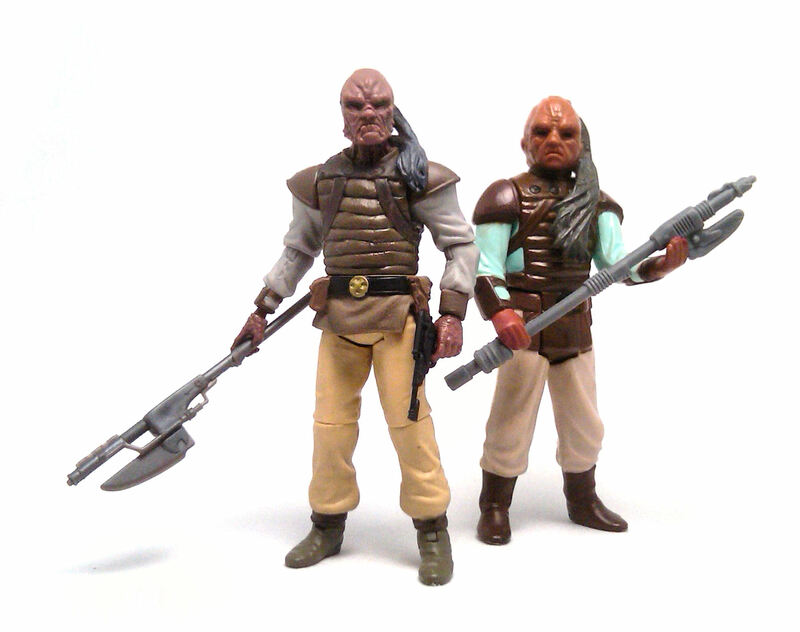 The Weequay doesn’t have a holster for it though, but probably the weapon was included just to up the play value of the figure. In the end, I know this Weequay may not be everybody’s cup of tea, but I do think this is the definitive version of this character and certainly a must buy.